Baleno RS is the upcoming premium and powerful hot hatchback from Maruti Suzuki. Currently Maruti Suzuki sells Baleno which is one of the most successful cars currently in Indian market. The company is now adding a new variant RS (Road Sport) that features a 1.0 lite BoosterJet turbocharged engine. The launch of all new Maruti Baleno RS will happen on 3rd March 2017. The all new Maruti Baleno RS will be made available in 6 different color variants. 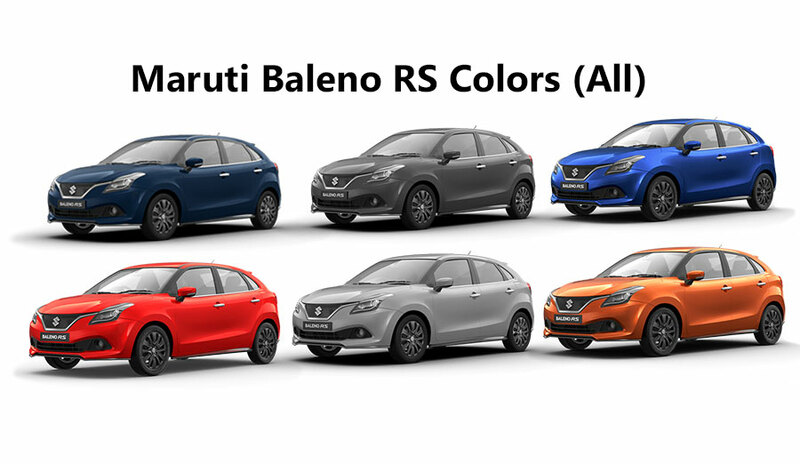 The all new Baleno RS will be offered in similar 6 colors that are offered for standard Maruti Baleno model. This is how Maruti Baleno RS looks like in Granite Grey Color. Maruti Suzuki Baleno RS is offered in premium silver color. This is how all new Maruti Baleno RS looks like in Silver color. Maruti Baleno RS gets Urban Blue Color. Following is the picture of all new Maruti Baleno RS in Urban Blue color. Watch the video on BoosterJet engine which is going to power Maruti Baleno RS. Just like Baleno, even the Maruti Baleno RS will be sold exclusive in NEXA showrooms that are present across India. Which Maruti Baleno RS color do you like the most?